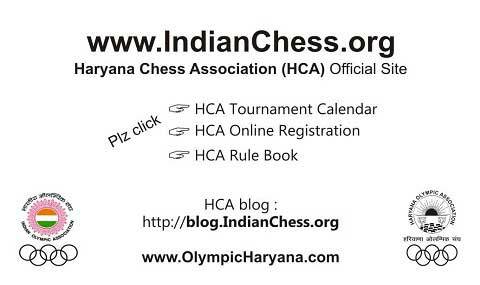 I/Player declare that I shall abide by HCA rules & regulations and latest amendments/decisions of HCA as the case may be and cooperate with HCA officials on duty during participating in HCA District, State and National level Chess Championships. Player ensure that he must follow all HCA rules before applying HCA Online Registration, otherwise form will be rejected straight way without correspondence. Players are advised to read "HCA Instructions" carefully before applying HCA Online Registration. Wrong information found in HCA Online Registration form will be rejected straight way and no correspondence will be entertained in this regard by HCA. Confirmation note - "Thank you for your message." above "HCA Tournament Start Date" column; Confirms your HCA Online Registration. No confirmation will be sent thru Mobile msg, E-mail etc. Pay Entry Fee (by hand) on 1st day (9 AM or in due time) of respective championship. All participants (Male + Female) must report to Secretary General HCA on 1st day 9 AM or in due time @ venue of respective championship. Players are instructed to first download and read "Prospectus" of championship and then apply for HCA Online Registration. HCA Online Registration can only be done for those championships in HCA Tournament Calendar where Download Prospectus link is available. Last date for HCA Online Registration is 3 days before "HCA Tournament Start Date". List of Online Registered Players are available 1 day before "HCA Tournament Start Date". To download List of Players Plz visit "﻿LIVE Pairing & Results﻿" page. 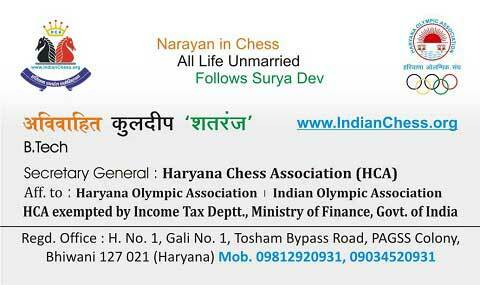 List of Online Registered Players may publish on www.IndianChess.org in a gap of each 10 days e.g. nearby 10, 20, 30th day of each month. Players are not required to send hard copy of their Online Registration form to HCA. However, they can retain hard copy of their HCA Online Registration form for their record. Players who does not find their name in List (Online Registered Players) can meet Secretary General HCA in person along with proof of HCA Online Registration upto 5:00 P.M.. on 1 day before Tournament Start Date. There after no complaint in this regard will be entertained. After click "Submit" button, you will get a confirmation note - "Thank you for your message." above "HCA Tournament Start Date" column. By submitting this form, you acknowledge that information entered here is accurate to the best of your knowledge. HCA is not responsible for any inaccurate or misrepresented information, or liabilities arising therefrom.